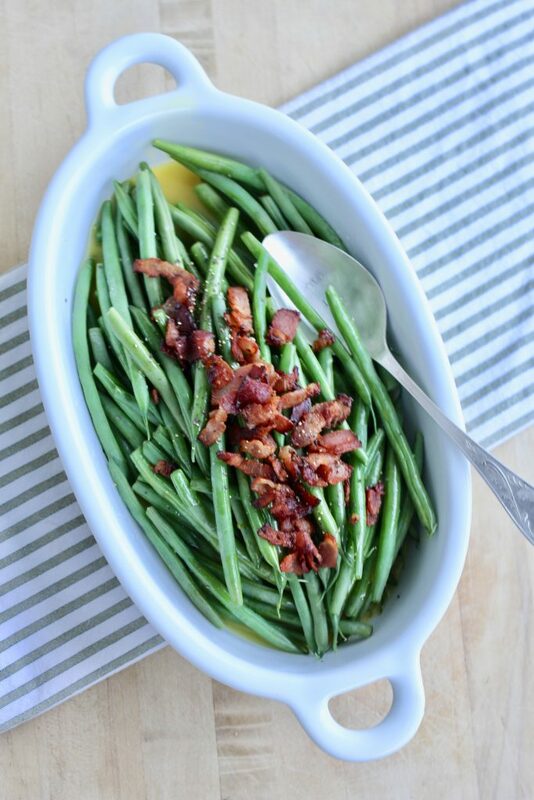 Brighten up your holiday table this year with Green Beans with Orange Glaze! They’re so easy to make and the perfect side dish to add a little color, crunch, and flavor to your traditional holiday menu. The holidays. The most wonderful time of the year. A time to start planning menus for upcoming dinners, brunches, and parties, and a time where there is always something cooking in the kitchen. 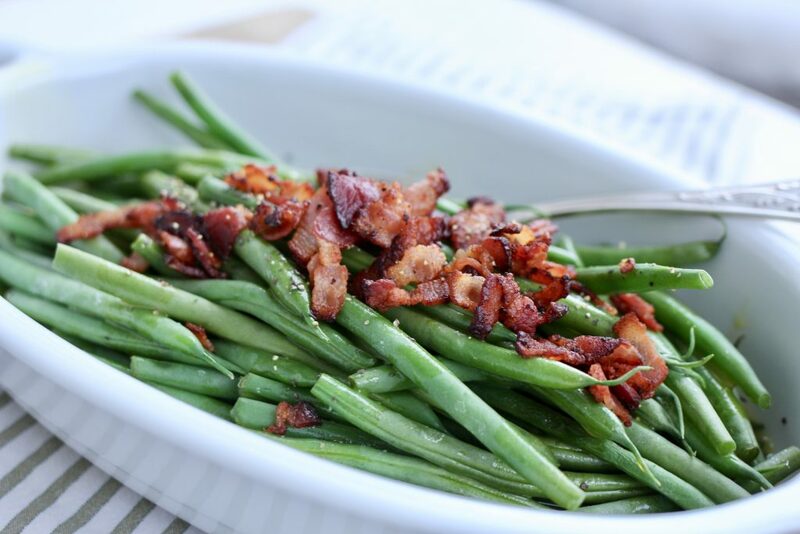 Green Beans with Orange Glaze are a delicious twist on the otherwise ordinary vegetable. Sweet, a little bit savory, and a whole lot a flavor make this side dish a hit in any home! They’re fresh, green, crunchy, and different than your regular ho-hum green bean casserole. A simple glaze on fresh veggies is the way to go when planning a menu for a large crowd. It’s a delicious way to add a lot of flavor without adding all the calories a typically calorie-laden green bean casserole. 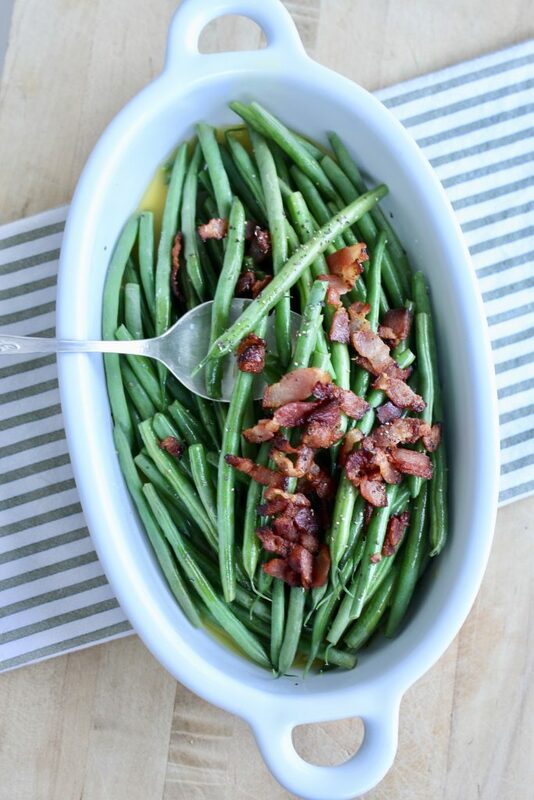 So for all my health conscious readers, these Green Beans with Orange Glaze are for you! And really anyone else, even the young ones. I’m guessing you won’t be bargaining with your kids to eat this veggie dish. There are so many ways to make green beans. I know what you’re thinking.. orange and green beans? Yes! They go together like bread and butter. That little bit of citrus compliments the earthy green bean flavor perfectly. 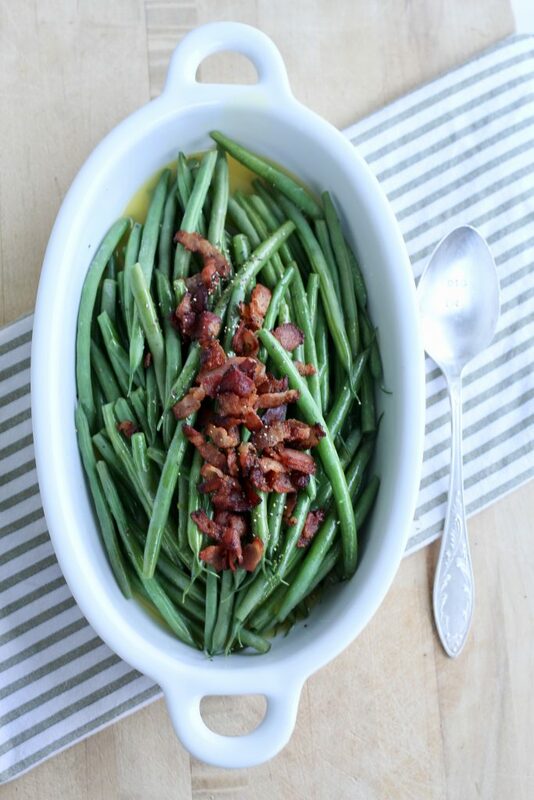 Green Beans with Orange Glaze are fresh, light, and festive enough for the holidays. And there’s nothing wrong with adding one more tasty dish to the table! 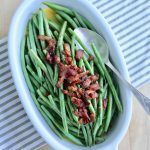 Green Beans with Orange Glaze are the perfect seasonal side dish to share at any holiday gathering, or year ’round for that matter! They’re simple, festive, flavorful, and add a little change in scenery to the traditional turkey, dressing, potatoes, rolls, gravy, etc. spread. 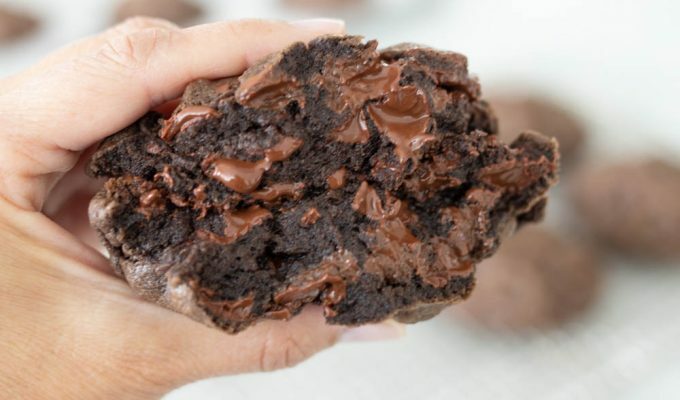 Trust me, this recipe is sure to become a new staple on your holiday menu. If you’re looking for other quick and tasty side dishes for your next gathering, here are a couple of our favorites: Italian Zucchini Sticks and Sautéed Brussels Sprouts and Apples. What could be more simple? 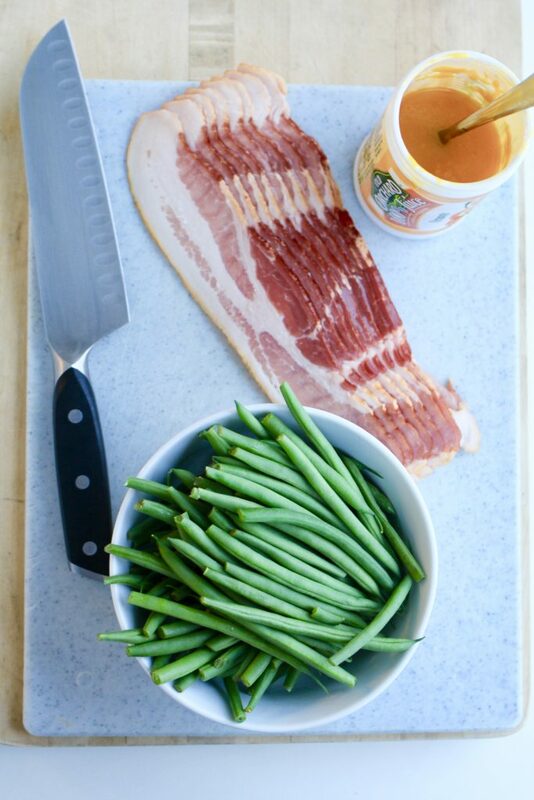 Fresh green beans, crisp bacon and a slightly tangy orange sauce made with OJ concentrate! This recipe takes 15 minutes to prepare (mostly cooking bacon) and is table ready in 20 minutes total! Cook bacon until crisp, drain grease and cut into pieces. Store in Ziplock bag with a paper towel to absorb moisture until ready to use if making ahead. Whisk orange juice concentrate and water together in a medium size sauté pan. Turn heat to medium high. Add beans. Cover with lid and cook for 3-5 minutes on medium high heat. Add a little water if needed. I cook just until the beans are bright green then remove from heat. Remove beans from heat, they should be bright green in color. Place beans in a serving dish and spoon sauce left in the bottom of pan over beans. Sprinkle with salt and pepper. Top with chopped bacon just before serving. Cooking the bacon may be done up to a week ahead. Store cooked chopped bacon wrapped in a paper towel. Place the bag in the refrigerator in a zip lock bag or other sealed container sealed tightly. Nice and simple! It will be on my experiment list surely! I hope you try this recipe, Ryan, and thanks for your comment! Thanks for your comment, William!